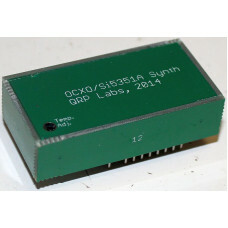 This kit is an Oven Controlled Crystal Oscillator (OCXO) version of the standard Si5351A Synthesiser module kit. The 27MHz OCXO is kit-built, it does not use an expensive commercial OCXO component. Yet it is still capable of very good performance. The Si5351A chip is pre-soldered to the PCB and all other components are through-hole type. Construction of this kit is more difficult than the other kits. It does not require any surface mount soldering, special techniques or equipment. However, very careful soldering is required. The construction steps must be followed precisely. Please read the assembly manual before purchase, if in doubt. The OCXO/Si5351A Synthesiser module kit is compatible with Ultimate3 and Ultimate3S QRSS/WSPR transmitter kits (requires firmware version v3.07 or above). It may also be used in your own projects. The Si5351A chip is programmed by a microcontroller using I2C. The photographs show the inside/outside of the kit, and the kit plugged into an Ultimate 3S kit.